I have a very loose definition of “health food.” Mostly, it just describes anything that isn’t as unhealthy as it COULD be. 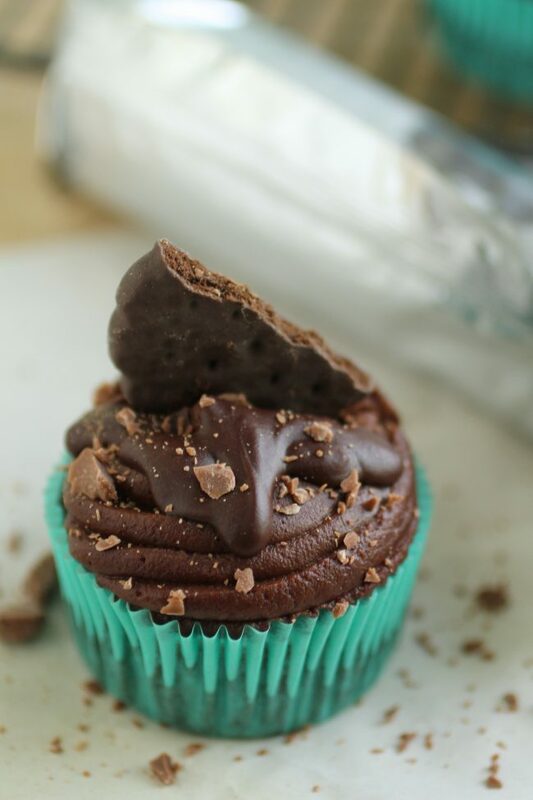 Like these cupcakes – I COULD have added butter, but I added super protein-y Greek Yogurt instead. BAM! Healthified. Sort of. Basically, it just makes me feel better about loading the “healthy” cupcakes with fudge frosting and chocolate ganache. And then topping them with cookies. You know how I do. 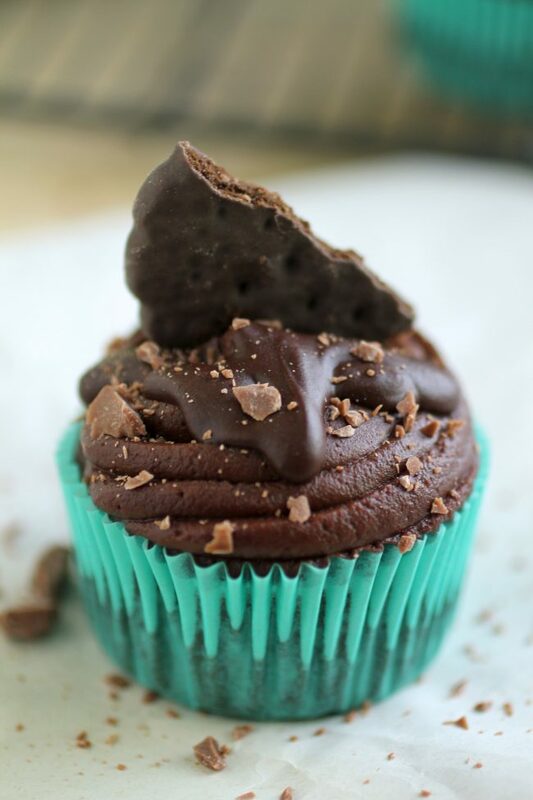 These mint beauties are a simple twist on my Chocolate Greek Yogurt Cupcakes from a few weeks back. 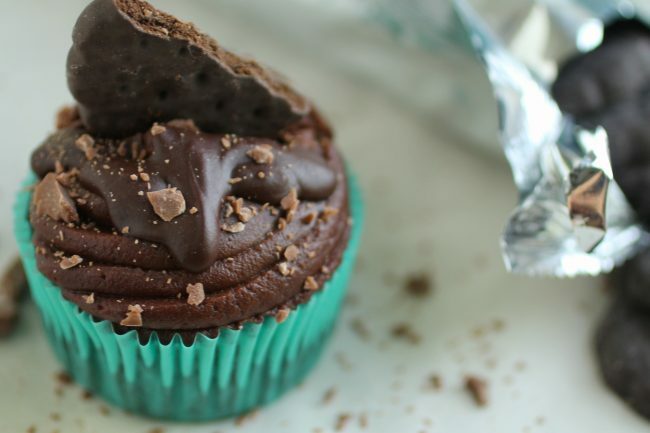 A minty, chocolatey, delicious-y twist. I brought a batch to work, actually, and my coworker told me that these were the best cupcakes I’d ever brought her. And I bring her a LOTTTTTT of cupcakes. A LOT a lot. So that was kind of a big deal. I really don’t have much to say today, actually. I think I’m still sleep deprived from celebrating America so much this week. And kind of in a food coma from billions of delicious barbecue things and fried chicken and frozen pizzas at midnight and an entire box of wheat thins that mysteriously disappeared from our coffee table over the course of one Mario Kart- and tequila-filled evening. (I didn’t eat it all MYSELF, guys. We had like ten people over. Chillax). Anywho. Cupcakes. America. Mario Kart. Tequila. It’s all good. Also, public service announcement: New Girl is now on Netflix. Kyle and I and our friends MAY or may not have watched an entire season of it in less than 24 hours this week. Partly because it’s awesome, and partly because I’m somewhat convinced it’s about my life. (Her name is JESSICA and she’s from PORTLAND and she has BANGS and she SINGS to herself and others to bring them good cheer throughout the day. I think Fox may have stolen my identity. For realz. Also, she has the same toothbrush as me. And bakes things. LIKE THESE CUPCAKES. But Kyle is still not convinced). Yup, that’s it. If you need me, I’ll be the one on the couch with a bottle of wine watching New Girl. Again. Followed by a rousing round of Mario Kart. Followed by probably making more of these cupcakes. 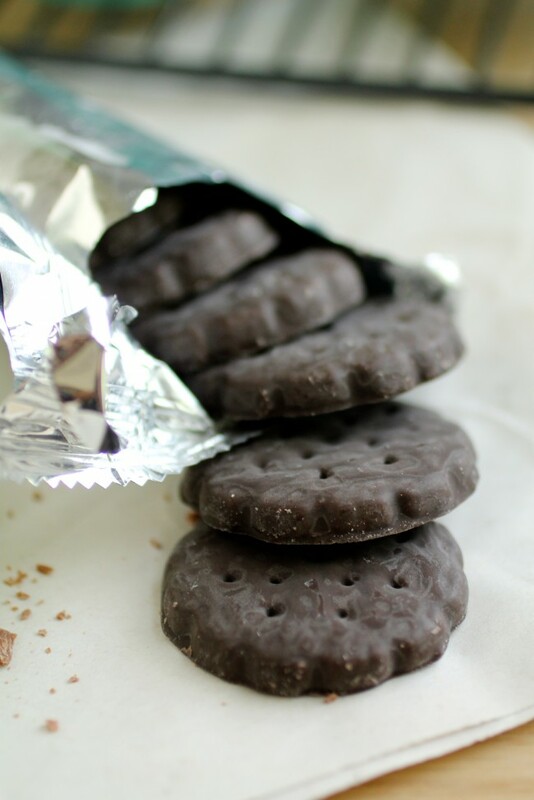 Optional toppings: Thin mint cookies (God bless the Girl Scouts. Seriously. ), chocolate shavings (just run a veggie peeler over a chocolate bar and voila!) or a sprinkling of chocolate chips! Whisk in vanilla and mint extracts. Fill cupcake liners ⅔ of the way full and bake at 350 for 15-19 minutes, until a toothpick inserted into the center of a cupcake comes out clean. Remove to a wire rack and let cool. Heat milk in a small saucepan over medium heat, whisking occasionally so it doesn’t burn, until it comes to a simmer. Place chocolate chips in a large, heat-resistant bowl (glass or ceramic are good choices). Remove milk from heat and pour it over chocolate, then stir gently until chocolate has melted and you’ve formed a smooth ganache. Stir in the mint extract and set ganache aside. Let this cool while you make the frosting. In a medium bowl, melt the butter (I use the microwave, it’s just easier). Stir cocoa and powdered sugar into melted butter. Pipe frosting onto cupcakes (I use a Wilton #1M or a ziploc bag with a corner cut off). You could also spread the frosting on the cupcakes with a knife. 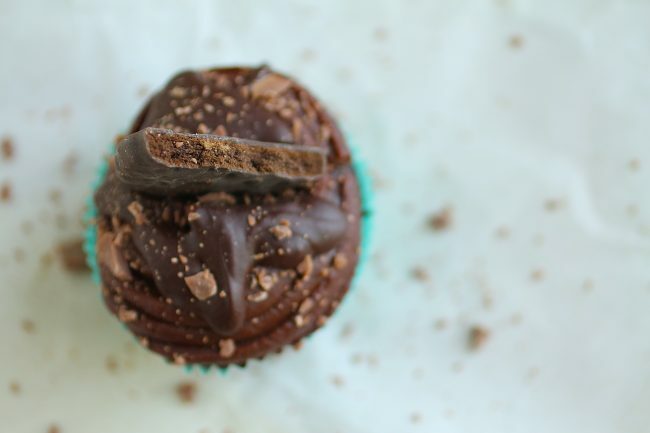 Give the ganache a stir, then drizzle a spoonful of it over each cupcake once they’re frosted. 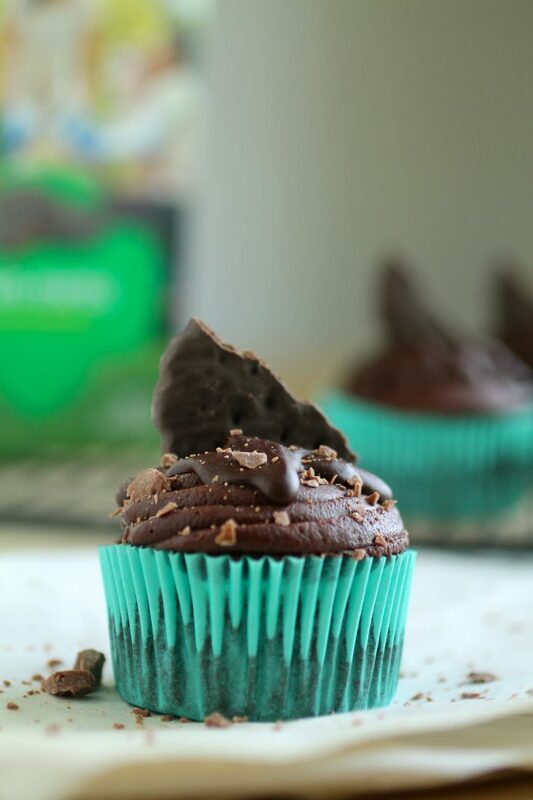 Top the cupcakes with a thin mint cookie and some chocolate shavings or eat them as is! This cupcakes looks really awesome and would love to try them, but i couldn’t understand what is the “buttermilk” thingy. Is it a substitution for butter? and can i use butter instead? One more question, Should we keep the buttermilk for a while like for couple of days before using it or use it right after mixing it? Buttermilk is just regular old buttermilk like you can buy in a carton at the store – I don’t recommend using it as a butter substitute because although they are both dairy based, they will have a very different effect on the final product. I don’t like to buy buttermilk and keep it in the fridge (I just don’t use it enough) so instead, whenever buttermilk is called for in a recipe, I substitute 1 cup of regular milk and add 2 Tablespoons of apple cider vinegar. It gives the same effect and acidity as buttermilk, and I don’t have to keep any special ingredients on hand! When I make my own buttermilk with the apple cider vinegar, I use it right away. If you opt for the store-bought variety, though, you can keep it in the fridge until the carton’s expiration date. I don’t miss any moisture in these cupcakes – the boiling water you add at the end of the recipe makes the batter a bit thinner than usual and starts the cooking process slowly, before the cupcakes even get into the oven, so they cook more quickly and aren’t shocked by the hot oven, which makes up for the moisture people sometimes associate with just butter and oil. I like your cupcakes very much. I’ve featured this recipe on my blog, hoping that you don’t mind, but if you do, please contact me and I’ll remove it. All the best. Is that a Thin Mint I see? How do you even have any of those left right now?! Mine were gone in 2 days tops, which is precisely why I have to limit my purchase. These cupcakes look amazing! You and I definitely have the same definition of healthy. Those look darn healthy to me! I heart New Girl. Jess is Hi-larious.